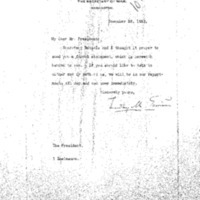 Lindley M. Garrison writes to Woodrow Wilson enclosing a letter from him and Josephus Daniels. Secretary Daniels and I thought it proper to send you a formal statement, which is herewith handed to you. If you should like to talk to either one or both of us, we will be in our Departments all day and can come immediately. Garrison, Lindley M. (Lindley Miller), 1864-1932, “Lindley Miller Garrison to Woodrow Wilson,” 1913 December 18, WWP18225, First Year Wilson Papers, Woodrow Wilson Presidential Library & Museum, Staunton, Virginia.